Kengo Kuma strives to create buildings that are sensitive to context. For him, architecture is most successful when it upholds interrelationships inherent in the natural environment. Kuma employs natural materials in designs that merge the regional vernacular with a sublime minimalism often resulting in an effect of dematerialization. “Rather than pursuing one’s original style as an architect, you actually visit the place and follow what grows out of it,” in Kuma’s words. One of his most lauded works is Water/Glass, a house in Atami, Japan he designed in 1995 which incorporates an exterior flooded terrace that connects it with a view of the Pacific Ocean. In 1997, Kuma received the Architectural Institute of Japan Annual Award for Noh Stage in Forest, Toyoma Center for Performance Arts, an open-air complex that hosts performances of Noh theater, a form of 14th-century Japanese musical drama. In Chengdu, China, Kuma designed the Museum of Wisdom with an exterior scrim incorporating tessellating roof tiles, common to nearby thatched homes, horizontally suspended with steel wires. Recent works include the China Academy of Art Museum in Xiangshan, China; the Besancon Art and Culture Center in Besancon, France; a headquarters for a French sportswear company located on Mont-Blanc designed with an exterior comprised of unskinned panels of oak; and “Jyubako” a mobile home trailer developed for a Japanese sportswear company intended to serve a nomadic user. At the 15th International Architecture Exhibition of the Venice Biennale, he designed Floating Kitchen, an installation comprised of staggered shelving and traditional Japanese kitchenware to celebrate Japanese culinary culture. Kuma was recently commissioned to design the National Olympic Stadium to serve the 2020 Summer Olympic games in Tokyo; a high-rise residential complex in the central business district of Moscow; the Saint-Denis Pleyel metro station in Paris; and the V&A Museum of Design, Dundee, Scotland. 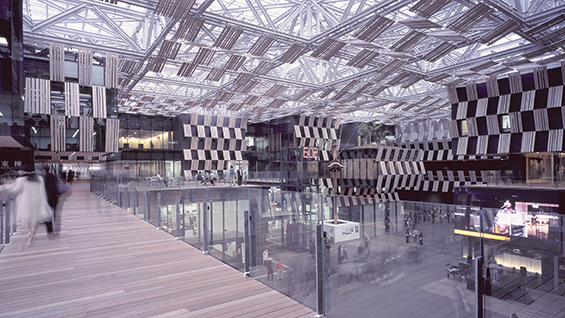 Kuma completed his Master of Architecture degree from the University of Tokyo in 1979 and established his own practice in 1990 which would eventually become Kengo Kuma and Associates. In 2008, he opened a Paris office. Alongside his practice, Kuma is a prolific writer and teaches at the Graduate School of Architecture, University of Tokyo. In 1997, he won an AIA DuPoint Benedictus Award for Water/Glass, a Spirit of Nature Wood Architecture Award in 2002, and most recently a Global Award for Sustainable Architecture in 2016, among many others. In 2009, he was decorated with the French Ministry of Culture’s Order of Arts and Letters.